If anyone has written an article, please forward the article with the pictures to the webmaster. 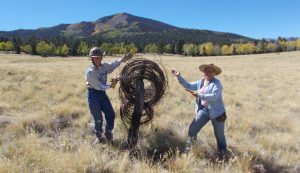 In September, Front Range Chapter BCH did a four-day work weekend at Huerfano State Wildlife Area and surrounding public lands near Gardner, Colo. We worked for four days on same project in 2017. 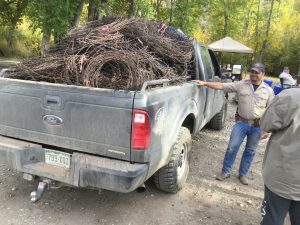 In 2018, we pulled out five miles of very old barbed wire fence. Most was down and tangled, so it had to be pulled out of dirt, grass and trees. Then we rolled it for the U.S. 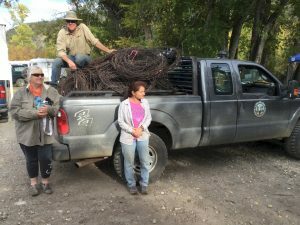 Fish and Wildlife officials to haul away. We also fixed holes in a water stock tank, trimmed and cut trees off trails, plus worked on a steep switchback trail which was full of loose rocks. The whole area is now safer for everyone. We had about 20 volunteers both years and set up a camp kitchen where we shared great food and fun times. 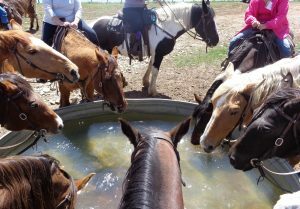 It goes to show that a group of folks who want to join together can accomplish much work while still having a wonderful outing, camp with our horses, and get to know each other. FRBCH – Last Child in the Woods? Not Here in Colorado! 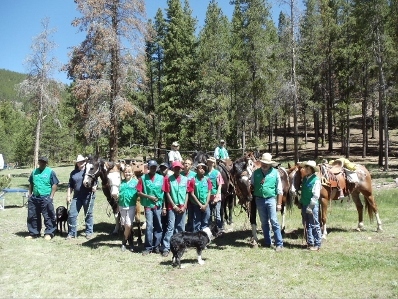 Students from 5th to 12th grade continued their annual training of skills with trail maintenance training and horsemanship in the Pike National Forest. Carl Dixon from the Kappa Alpha Psi noted it is part of the students’ education for community involvement and training leaders of tomorrow. He said the campout allows city youth exposure to nature and horses, along with living and dealing with the outdoors. Teams were formed to perform trail corridor clearance, create waterbars, resolve mud bog issues and trail tree removal. New skills were learned, e.g., how to use rock bars, moving large rocks with austins and how to load panniers for the pack horses. Sitting around the evening campfire talking, laughing and sharing the day’s events were bonding. A discussion of the current national events brought a serious note to the evening and a closer bonding by all. Only five boys participated in the first campout. Since then the group has grown and has been capped at 20 boys. Now the program is so popular, students compete for the ability to attend. Many thanks to Pam Doverspike and her crew for spending many hours in planning this important campout as the boys look forward to another adventure in 2016. FRBCH held its 2nd annual campout in July with Troop 2732 from Centennial Colorado. 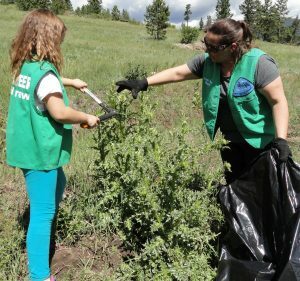 Young girl scouts had an adventure in identifying and eradicating musk thistle and common mullein on the AG Ranch. 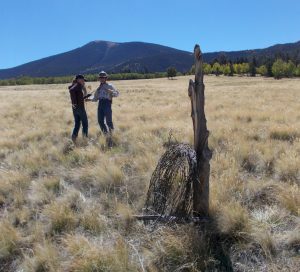 The ranch is home of the Region 2 Specialty Packstring for the Forest Service. 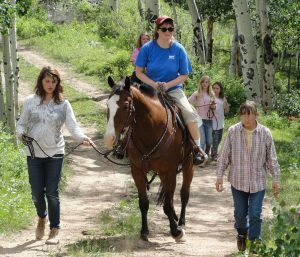 The Girl Scouts earned a camping badge and learned horsemanship skills with the horses brought by the members. A whopping 365 pounds of weeds were eradicated followed by the evening of horsemanship and riding. Thanks to Kitty and her crew in the countless hours preparing for the campout. This year was our 5th year of collaborating with boys from inner-city Denver, and this was the best year yet for everyone involved. We all came together with the intent of trail maintenance. 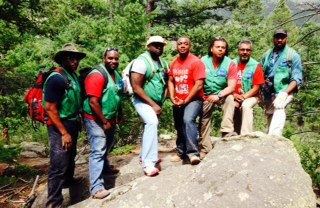 The weekend participants included 7 mentors from Kappa Alpha Psi Denver Chapter, 20 boys, and 15 FRBCH members. 14 of the boys were junior high age and the remaining 6 were seniors in high school. This FRBCH event has become one of my favorite events of the summer. It is awesome to be involved in helping to create memories for these boys, while providing them with an opportunity to experience, learn about, and enjoy the wonderful Colorado Mountains. This successful weekend was made possible because of the generous volunteers at FRBCH. To start things off, Dan and Kitty met with the Forest Service’s Glenn Ryan to scout out an area where the boys could do trail maintenance. Julie S. and I shopped and her truck was soon loaded with food, cooking utensils, stoves, awnings, and water. Our infamous FRBCH porta potties were present as well! Julie was unable to attend the whole weekend, but was kind enough to haul the trailer up, help us set up, and come back on Sunday to haul the trailer back down the mountain. The weekend was full of education and learning opportunities. Education began Friday night with a talk from Forest Service’s Ralph Bradt on career opportunities with the Forest Service and on the forest as public lands. He stressed how important the boys’ volunteer time on trail maintenance is not only to current users, but to future generations as well. Dee Lyons continued with an informative talk on the 50th anniversary of the Wilderness Act. Saturday morning, after a hearty breakfast, the boys learned key points regarding wilderness survival from Kim Meyer. She did a great job of involving her audience. I followed up with a short talk on wilderness first aid. Julie C. finished the weekend of education Sunday morning. She spoke about “Leave No Trace”- appropriately timed as we were all packing up to go home. Friday afternoon we split into 2 groups, and were off to do trail maintenance. Thankfully, Glenn Ryan had marked the trail where he felt water bars and check dams were needed. One group started at the north end, and the other group started at the south end of the trail, and we met for lunch when our work was done. The trail now has 14 water bars and 3 check dams. Many rocks were removed and a third of the trail was raked, widened, and groomed. Special thanks to Keith, Julie and Kitty for sharing their expertise in water bar installation. We then moved on to wilderness 1st aid scenarios. I sent the high school boys up the trail to pretend to have injuries, and then the junior high school boys were sent to find and treat them. After returning to camp, the two groups of boys were given 45 minutes to build a shelter that could house their whole group. We were careful to instruct them not to cut branches that had live needles and leaves. They found many useable materials in the area. The shelters they made were amazing; very strong and well-thought out. The last event of the day was to give our new volunteers an opportunity to ride a horse! Thanks to Linda, Keith, Rachelle, and Jaimie who made this possible. Thanks also to our wonderful and patient horses. The boys are involved in every aspect of the trip; they also do the cooking, clean-up and washing of the dishes with the supervision of the FRBCH members. Thanks to Patti, Signe, Linda, Kitty, Kim, and Rachelle for their assistance in the camp kitchen. Sunday everyone pitched in to break camp and to “leave no trace”. Hopefully, it would be difficult to tell where we were camped. Sunday, more FRBCH members came to help us load up. Thanks to Doug and Sharon Root and Julie S. for all your help. Thank you to FRBCH for supplying the food and volunteers to allow such a great event to flourish year after year. This truly gives kids a chance to “give back” thru volunteering while experiencing our great outdoors. They leave with memories and stories that will last a life time. It is a true testament that we have an impact on these kids, as the original 5 boys have come back to join us for 5 years. It is my hope that someday they will be the mentors that bring Denver youth to our wonderful backcountry. It is my hope that the partnership between the FRBCH and this Denver youth group will continue for many years to come. 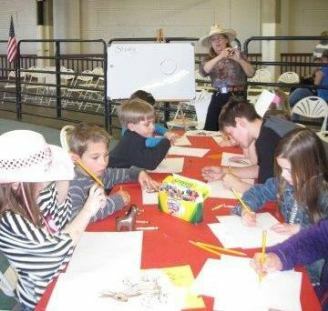 Front Range chapter of Colorado Back Country Horsemen sponsored “HOW TO DRAW” art classes at the Horse Expo by providing all the art supplies. This turned into a very fun event for children and was free to all. Children from ages 3 to 13 years old plus several parents and grandparents took the classes, some returned to repeat the class. The children were all very enthusiastic and well behaved. I also had created several sheets of animals to color for the very young. Most all students wanted to learn “HOW TO DRAW A HORSE”. Kids love HORSES! I held two classes each day of the Horse Expo, and even though we had some bad weather, one class had 22 children and an adult. I made the class very simple and took the children through drawing a horse step by step. It was heartwarming how parents and even small children came up to me after class to thank me. Every student was able to take several “how to draw” different animals and some coloring sheets of different animals home with them. On July 20, 2012 Front Range Back Country Horsemen (FRBCH) recognized six BCH members, Julie Chaney, Karen Otterstein, Cathy Howard, Jennie Diesslen, Rachelle Bubach, Susan McKelvy and two time completer guide Pam Doverspike, for their completion of the 485-mile ride of the Colorado Trail (CT) through the Rocky Mountains. Completion of this ride has took five years with help from volunteers. FRBCH has donated over $12,000 to the Colorado Trail Foundation thanks to the volunteers and riders who have supported this event. Each rider was awarded a Certificate of Completion by the Colorado Trail Foundation and a gift from FRBCH to commemorate their achievement. 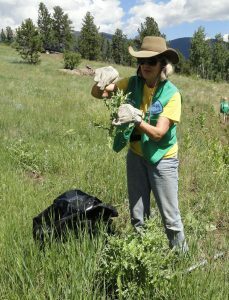 Since 1986, the Colorado Trail Foundation volunteer organization has maintained the CT. Work is done in cooperation with US Forest Service. The CT connects Denver to Durango crossing eight mountain ranges, fice national forests, six wilderness areas and five river systems. Most of the trail is single track with an average elevation of 10,000 feet. The lowest point is 5,520 feet at Waterton Canyon and highest point being 13,334 feet at Coney Summit. Each year of the ride was an adventure! FRBCH members Julie Sabados, Julie Chaney and Pam Doverspike planned the logistics, including everything from researching ride distances and camping locations, to daily menus (what great food we all enjoyed) and equipment needs, to calculating and purchasing horse feed. Our wonderful volunteers put the plan in motion. Each day the support crew would make breakfast, put out lunch items and then the riders would head out. While the riders were on the trail (from 10 to 22 miles a day) the support crew would load up everything and head to the next destination, filling water tanks, servicing the port-a-potties and getting needed supplies along the way. Once at the night’s destination, the support crew would set up the camp kitchen, tree lines and prepare dinner. Imagine hauling port-a-potties, horse and utility trailers (with food and camping gear for 18 horses, the riders and volunteers) over 4WD roads at over 12,000 feet elevation. Just this year alone the support vehicles had three flat tires on three different vehicles in one day. It is a sight to riders and support crew alike when they arrive at the days’ designated camping area. The support crew makes a long day in the saddle bearable and we cannot thank them enough for everything they do! Teamwork and cooperation are essential to achieve the mutual goal of riding and enjoying our amazing Colorado mountains. It is a vastly rewarding accomplishment with your horse that so few get to experience. In addition, there are the life-long friendships that are formed from sharing these experiences year after year. On behalf of FRBCH and The Colorado Trail Foundation, I again would like thank all who contributed, volunteers and riders alike, to an amazing five years on the Colorado Trail. 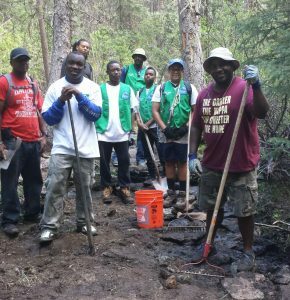 Each year, our chapter works with the Forest Service on various projects. Many of us are working on trails or education; however,the highlight of our year is doing ambassador patrol while the families are up cutting their Christmas trees with a forest service permit near Buffalo Creek, Colorado. We decorate our horses and ourselves in holiday gear and ride around offering to help out if needed. If there is a problem, we provide contact with the Forest Service. 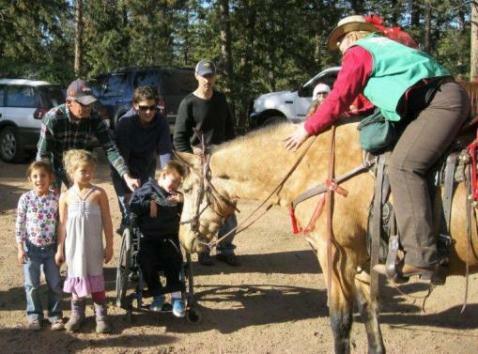 This year my heart was touched when a young boy in a wheelchair wanted to pet my horse Echo. With many other children alongside of him, he pushed up to Echo and she put her head down into his lap so he could pet her. The rewards of these moments are dear to our hearts, put us in the spirit of the holidays, and make us thankful for how blessed we are. I thank our new member Helena for taking this moving photo. 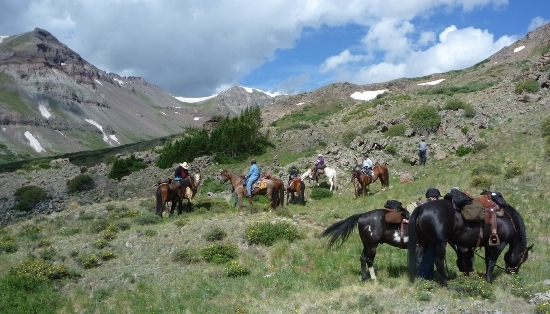 Front Range Back Country Horsemen participated in an event hosted by Jefferson County Open Space. Camp Junior Ranger was held at White Ranch Open Space Park during the weekend of June 23-24. The project was developed as a weekend camp-out experience for parents and kiddos who may have never camped before. Jan Kray, Jean Shilling, Shirley Howington, and I set up the station called Giddy Up with Back Country Horsemen of America. The focus was to introduce youngsters and families to the concepts of Leave No Trace, horses, trail maintenance, and responsible stewartship of the lands. A coloring book created and donated to the FRBCH by artist Sherry Baker was used to explain about horses and gear, equipment, concepts of camping with horses, and Leave No Trace. Securing the horses to a highline was a main attraction and a perfect teaching tool. In addition to the camping experience, the rangers set up various stations to spark interest in nature and learn about how to enjoy the outdoors respectfully. The stations included the tree doctor, bug books, animal pelts and taxidermy, trail safety and first aid. 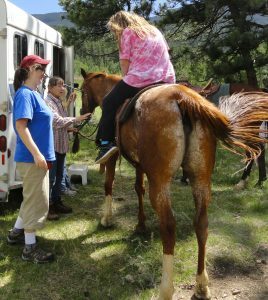 Front Range Back County Horseman (FRBCH) team up with Denver City Youth to maintain trails in the Pike National Forest. The youth are being mentored by the National Fraternity of Kappa Alpha Psi Denver Chapter to be college bound. Their education on the path to college includes mentoring and tutoring by successful college graduates and giving back to the community through volunteering. 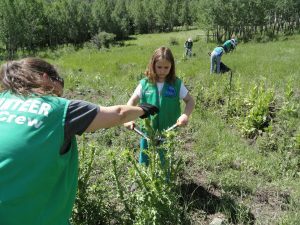 FRBCH gives this group of youth the opportunity to learn about the great Colorado Back Country by volunteering to build and maintain trails – an unusual opportunity for most inner city kids. The program is a collaboration between Tracy Taylor, a Southern University of Baton Rouge graduate and member of Kappa Alpha Psi and Pam Doverspike, FRBCH Director along with other FRBCH volunteers. 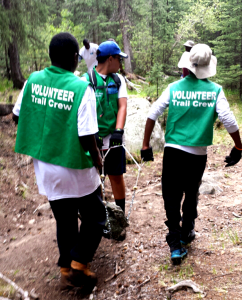 More than 15 middle school boys have volunteered with FRBCH during the past 2 years, introducing them to the great Colorado back country, and teaching them teamwork and the rewards of volunteering. A typical project weekend begins with teamwork; putting up the wall tent, setting up cots and settling in. They are taught camp cooking, cleaning and Leave No Trace princples in the great outdoors. To start the work day everyone pitches in to help prepare breakfast, clean up and pack lunches. After an in depth safety training, we gather the crew, tools and horses and head for the trail. The projects can include all types of trail maintenance such as; tree removal, corridor clearing and building water bars. However, it is not all work! They also get to experience hiking, camping, cooking, and the reward of sitting around the campfire after a good day of clearing trails. This project has been a successful venture between FRBCH and the middle school boys from Denver’s inter city this is an event FRBCH looks forward to every year. It has proven to be very popular with the Denver City Youth also – based on the waiting list and requests of the boys that want to be included. We hope to keep this project going for many years to come.